Keeping you moving. Getting you better. We’re here to help get your body back to full fitness after pain, injury or surgery. So you can do that triathlon, enjoy a kick about with the kids or just potter round the garden. We know how important these things are for your wellbeing. 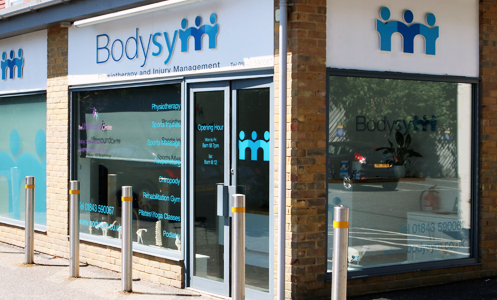 Bodysym staff are experts in diagnosing and treating all types of musculoskeletal problems: any pain or injury affecting your muscles, joints and bones. Whatever you’re facing, we’ll identify the issue and help you manage it. We want you to get better as much as you do. We take a hands-on approach to gather evidence so that we – and of course you – can fully understand what’s wrong. Then we create a tailored rehab programme to help you work your way back to full fitness. Seeing a physio before an operation might seem pointless. But research shows pre-op conditioning can help the recovery process by activating weak muscles and improving flexibility. And after the op, rehab boosts muscle function, strength, range of movement and fitness. All of which speeds up your recovery – bingo! Professional clinic and skilled physiotherapists helped me manage my ongoing pain. Bodysym are members of the Chartered Society of Physiotherapy and the Manipulation Association of Chartered Physiotherapists (MACP) also registered with Health Professions Council & Physio First the highest standards of clinical practice in physiotherapy.